Citation Information: J Clin Invest. 2006;116(1):174-181. https://doi.org/10.1172/JCI25641. 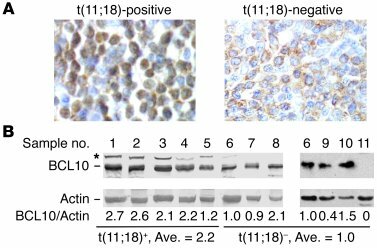 BCL10 expression level is enhanced in t(11;18)/cIAP2-MALT1 lymphomas. (A) Immunohistochemistry analysis of BCL10 expression in t(11;18)-positive (left) and -negative (right) MALT lymphomas without t(1;14)/IgH-BCL10 and t(14;18)/IgH-MALT1 translocation. Formalin-fixed paraffin-embedded tissue sections from MALT lymphomas were immunostained with anti-BCL10 antibody. Original magnification, ×400. (B) Comparison of BCL10 expression levels in t(11;18)-positive and -negative MALT lymphomas. Extracts made from MALT lymphomas were analyzed by Western blotting with antibodies against BCL10 (top) and actin (bottom). Samples 1–5: t(11;18)-positive MALT lymphomas; samples 6–11: t(11;18)-negative MALT lymphomas with neither t(1;14)/IgH-BCL10 nor t(14;18)/IgH-MALT1. The ratios of BCL10 to actin signals relative to that of sample 6 and the average (Ave.) ratios among t(11;18)-positive and -negative samples are given. Each sample contained approximately 70% tumor cells and 30% T lymphocytes and stromal cells. *Phosphorylated BCL10.